Call him an earth sleuth. Wenwu Tang, assistant professor in the Department of Geography and Earth Sciences, scoops up information from a targeted locale and analyzes it for clues to address any number of societal problems with a spatial component. 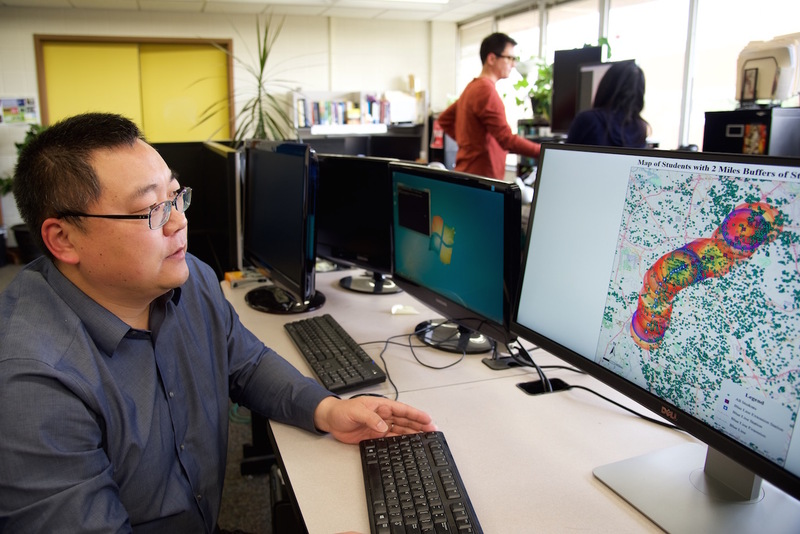 With his research, Tang looks at land use, land cover change, how traffic patterns may influence transportation, how pedestrians or animals may move in an area or even how disease may spread. The tools of his trade include fieldwork and cutting-edge computational science. As executive director of the UNC Charlotte Center for Applied GIScience (CAGIS) and with a research focus of complex adaptive spatial systems, Tang is a leader in the new frontiers of cyber-enabled Geographical Information Systems (GIS) and spatiotemporal analysis and modeling. His work illustrates the broad capability of CAGIS and its resources. Increasingly called upon by other researchers to lend his expertise, he has developed a Geographically Aware Intelligent Agents framework that helps integrates simulation, optimization, and mapping, and which facilitates modeling of geographic information systems, including coupled human and natural systems. “It promotes our understanding of the spatial complexity of these systems,” he says. Toward that end, Tang is partnering with Gary Silverman in Public Health Sciences and Eric Delmelle, also in Geography & Earth Sciences. They are working with the Gaston County Department of Health and Human Services, which received a $670,000 grant as part of a “Healthy Wells” program through the Centers for Disease Control and Prevention. Tang’s role is to develop a spatiotemporal database for Gaston County that will be used for mapping and analysis. Short-term, the study will result in a public digital database of the county’s wells that can be used in a number of ways to analyze water quality. Long-term, the study will look at the impact of two coal ash ponds that could have the potential to contaminate groundwater. Even longer-term, the system they are developing holds nationwide implications. While any person drilling a well in Gaston County must file for a permit and have the water quality tested, none of the information from more than 11,000 wells in the county had been digitized. This gap prevents researchers and officials within the county from having the capability to monitor and analyze results within a certain radius of the coal ash ponds, for example. Tang and a team of undergraduate and graduate students are working to change that with a Web GIS portal. “It’s a quite good opportunity for students,” he says. The project has undertaken the laborious process of scanning and entering data from well permits dating back to the 1980s into a single portal. Another component of the project is fieldwork. A team will work through the summer to draw water samples from each well and test the water in a laboratory. Results will go into the database and will be another piece of information that will be used to analyze whether water quality changes over a period of time. On a regional basis, Tang uses spatiotemporal modeling with cyber GIS, another of his research areas. Before arriving at UNC Charlotte in 2010, Tang was affiliated with the National Center for Supercomputing Applications, where he honed his cyber GIS and supercomputing expertise. He is using that expertise to forecast urbanization and its impacts on the Southeast United States, for example, in the greater Charlotte Metropolitan Area. Through multi-spectral satellite imagery, Tang and CAGIS have tracked development in the region over the past 40 years. Basing projections on current land consumption plans, the Center modeled likely development patterns through 2030. The information is helpful to decision makers and the public. It helps forecast the consequences of current patterns of urban growth. Such modeling may also indicate a need for new transportation systems. Light rail is projected to arrive at UNC Charlotte in August 2017 and with it greater connectivity between campus and neighborhoods and business districts as far south as Pineville. Due to how it may change transportation models, Tang and Shen-En Chen, a professor in the Department of Civil and Environmental Engineering, are looking at making UNC Charlotte a zero-emissions campus through the use of such technologies as a micro people mover based on electricity or electric vehicles that might help move students. They have prepared a proposal to the N.C. Department of Transportation for the work. “I’m excited about this,” Tang says. “My role is to develop web GIS to collect information from faculty and students so we can best utilize these technologies to analyze needs and hopefully increase efficiency.” The Light Rail Mapping Project, another project that Tang did includes geocoding based on addresses of faculty, students and staff and analysis of their proximity to light rail stations. From a global perspective, Tang is part of a U.S. Department of Agriculture and U.S. Forest Service study that is taking an inventory of mangrove forests in Africa, including biomass and carbon stock. The mangrove, a salt-tolerant tree that helps stabilize coastlines and absorbs and retains significant carbon levels, may hold helpful clues to the implications of global climate change. Tang provides spatiotemporal modeling support to other researchers in the project. He identifies optimal locations for research plots using a spatial optimization algorithm so researchers can go directly to a research site rather than to a random location. Using Google Earth and Google Maps, along with information about mangrove canopy, he also identifies and digitizes stream channels, and pinpoints possible settlements where food and water may be obtained and locations for base camps. Another project, with Akin Ogundiran, professor and chair of the Department of Africana Studies, has Tang mapping the archaeological site of a Nigerian empire that dates back to the 1500s. “Data collection about the terrain and land use patterns will help Professor Ogundiran reconstruct the settlement dynamics in the area,” Tang says. Tang’s fascination with the earth and geography is grounded in a childhood spent near the eastern most cape of the Shandong Province of China and his love of the outdoors. His specialties in spatiotemporal work and cyber GIS transport him locally, regionally or globally, depending on the problem he is asked to help solve. It’s a model that suits him.